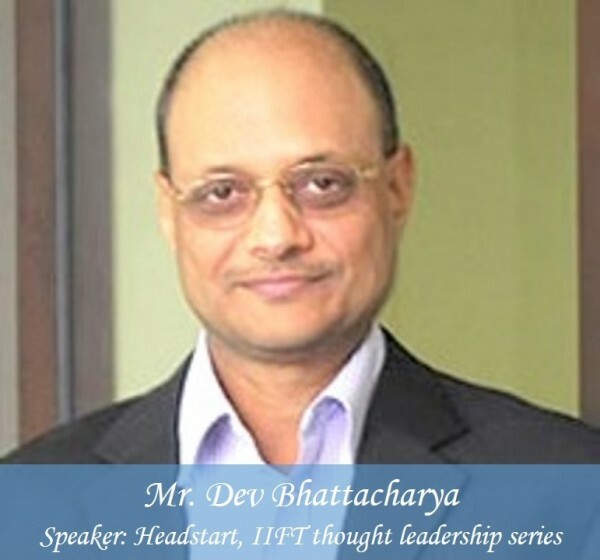 On the afternoon of February 12, 2014 the students of IIFT were lucky enough to get an opportunity of welcoming to the campus Mr. Dev Bhattacharya, the Group Executive President and also the Business Head of Solar Power Business at the Aditya Birla Group. 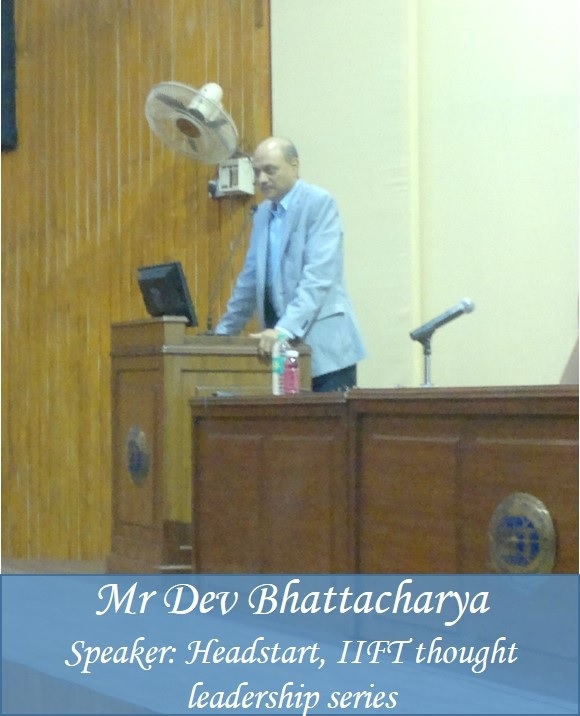 The guest lecture was organised under aegis of ‘Headstart”, the Golden Jubilee Celebration Guest Lecture Series of IIFT. Mr. Bhattacharya is a graduate of NIT Rourkela 1979 batch and pursued PGDIE form NITIE. At the beginning of the lecture he took us through the journey of his career so far and the various ups and downs associated with it. He joined TELCO in 1981 after passing out of NITIE in 1981. “Life was simple” he said and went on to contrast that with the technology driven society of today. He left TELCO in 1987 and had a few brief stints in various sectors such as Banking, Securities and even the entertainment industry. He produced the hit TV Series “Udaan” in the early nineties. He shared with the students the importance of building credibility in the minds of one’s customers by drawing example from his personal experience of the Harshad Mehta securities scam that rocked the Indian securities markets in 1992. He then went onto describe how he joined in Aditya Birla Group in 1996 and how the company has gone on to become one of the biggest conglomerates of not just in India but internationally as well. The floor was then opened up for questions and the students took the opportunity to ask questions on various topics ranging from the career opportunities to various businesses of Aditya Birla group to the strategy of ABG in different sectors. On the topic of whether or not the Indian companies should show global ambitions, He said that the Indian companies first need to be competitive domestically then think of going global. Mr Bhattacharya said that to go into China or Thailand markets, you cannot go in with standard availability. He stressed on the point that the companies should focus on differentiating themselves from the competition by having a unique value proposition. He also mentioned the fact that many of the Indian companies lack of global cadre in organisation and pointed out the need of developing more capable global managers before investing abroad. On the age old debate of the Generalist vs the Specialist, he was of the opinion that one needs to do a bit of both to fully understand the nitty-gritty of business. He mentioned that the on-ground job is difficult and sometimes it doesn’t give the larger picture of which direction a company is going. He stressed on the importance of moving around different departments if not different companies and urged students to have at least 4-5 years of operating experience to get a macro as well as a micro view. On the question of Aditya Birla Group going for a banking license he stated that “India is under banked” and there is a huge opportunity for bringing in new players. He opined that banks and financial lending organisations had recently gone overboard assuming that the growth of India enjoyed will stay forever, and as a result NPA’s have risen. But he also said that this phenomenon is not India specific and has happened all over the world. “There is a clear need of capital and we’re positive about the banking sector” he concluded on the topic. Abhishek is a first year MBA(IB) student at IIFT, Delhi. An Electronics & Communications Engineer by education, he is a typical Bong who loves his football, his music, his books and his sweets. 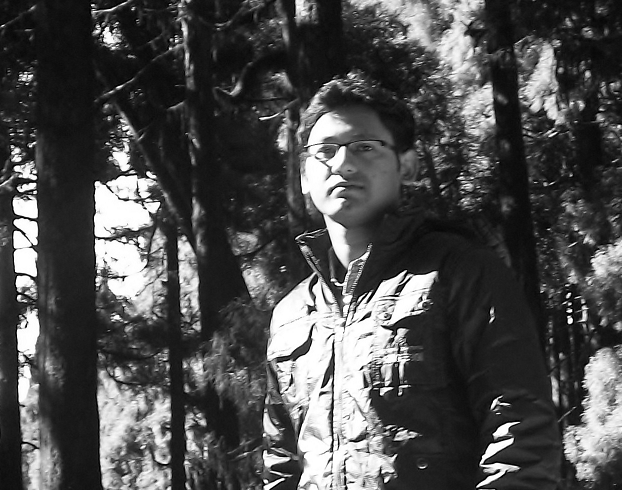 Abhishek will be doing his summer internship with Google.